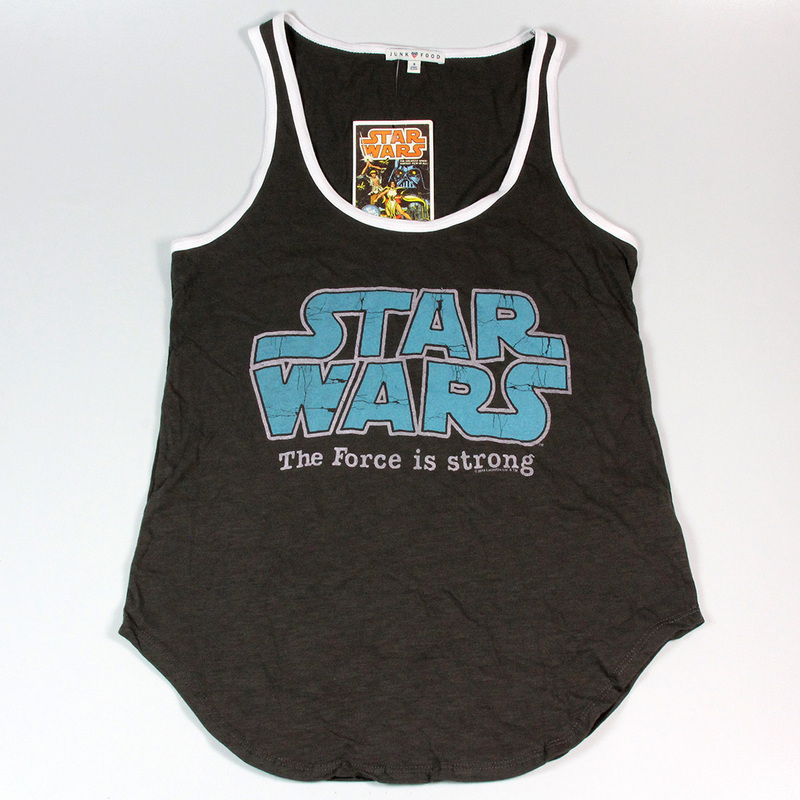 Junk Food Clothing has made Star Wars tops for women for years now, but as they only ship within the U.S. it has been hard for me to shop at a reasonable price. November last year they held a 20% off sale on their Star Wars range, which was a great opportunity for me to pick up a couple of pieces via my mail redirection service. I chose three pieces from their available women’s range at the time (the web store only has five styles currently in stock now). 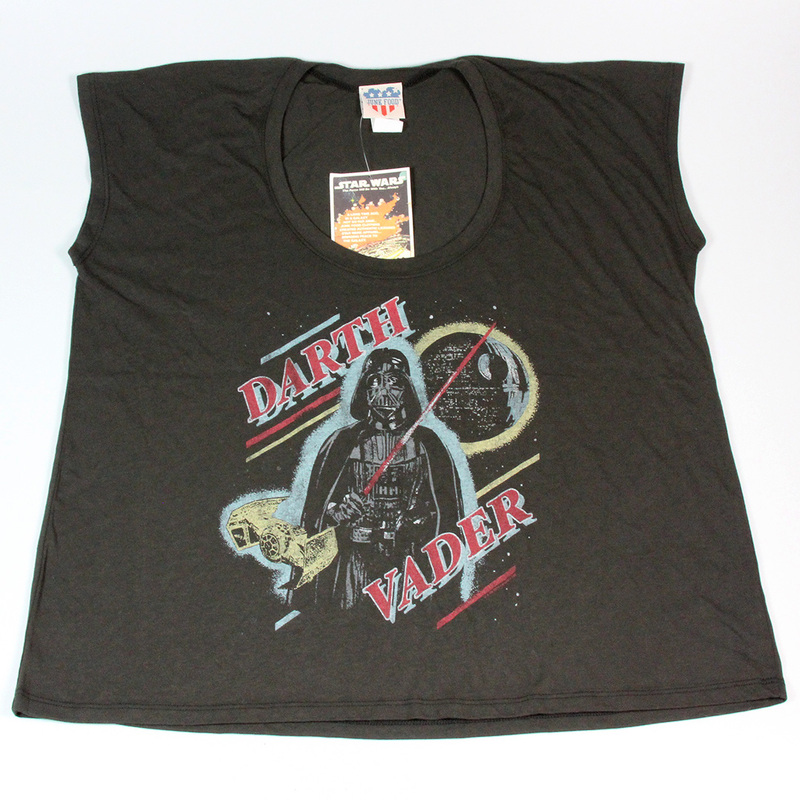 I bought the tops in size small, which are rather roomy – I don’t usually buy xs tops because some fit very snug (and it’s not too hard to alter a t-shirt smaller if desired). If I had the chance to try these on before buying, I would probably have sized down, but the loose fit does compliment the casual vintage styles. With the sale, I paid US$57 for the three tops. 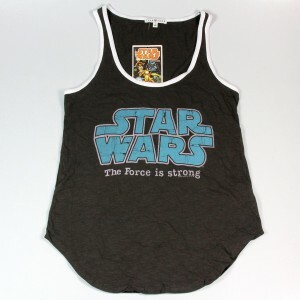 The first is a grey tank top featuring the classic line in an ‘opening crawl’ style. The fabric is 50% cotton, 50% modal, it feels lovely and soft. The main text is blue-green in colour, with the surrounding stars and spots in pink. 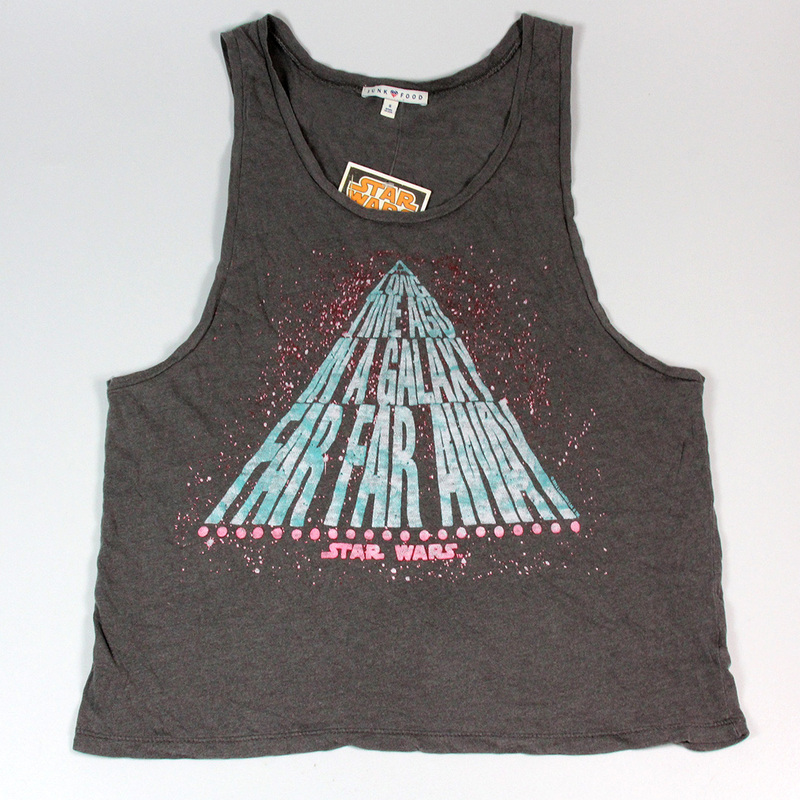 The arm holes are very low, in that casual summer style, best worn over a singlet/bandeau top. 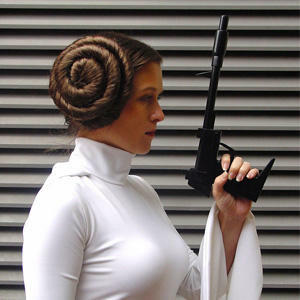 It measures approximately 49cm across (underarm to underarm). The second top is a darker gray than the first, with white contrast edging at the neckline and arm holes. 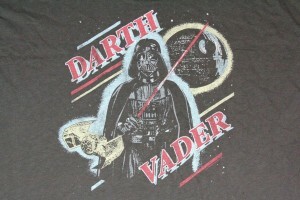 It features the classic Star Wars logo in a cracked effect blue-green with pale grey outline. 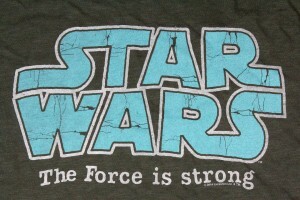 I love the line they used underneath – “The Force is strong”. 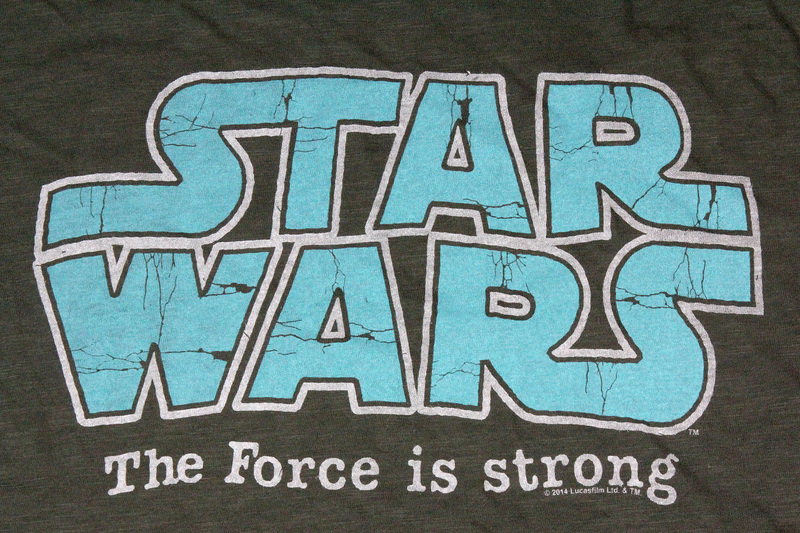 The fabric is 100% cotton, a little bit thicker than the first shirt. The curved hem is a great touch for this style, it’s my favourite top out of the three. It measures approximately 42cm across (underarm to underarm). The third top features Darth Vader, on a dark grey/almost black loose fit t-shirt. The fabric is 50% polyester, 50% cotton, a nice soft drape for this style. It’s printed image feels very vintage, with colours that remind me of the older comics. It is cut wide so it hangs at the shoulders, creating short sleeves without additional seams. It measures approximately 56cm across (underarm to underarm).